Everyone (or at least every car) needs tires. But how do you get people to LOVE their tires? Brodeur Partners helped Hankook Tire America Corp. to build a different type of relationship with its consumer – one that embraces things that are relevant to daily life – driving and having fun! Creative storytelling and social media engagement were at the heart of the campaign with subject matter ranging from the science of tire making to pitting Formula Drift drivers against models on Facebook and Twitter. By being topical and relevant, Hankook was able to engage and interact with consumers and build loyalty and share of voice in the highly competitive automotive sector. In just 11 years, Formula Drift has been established as the premier drifting series in the United States. 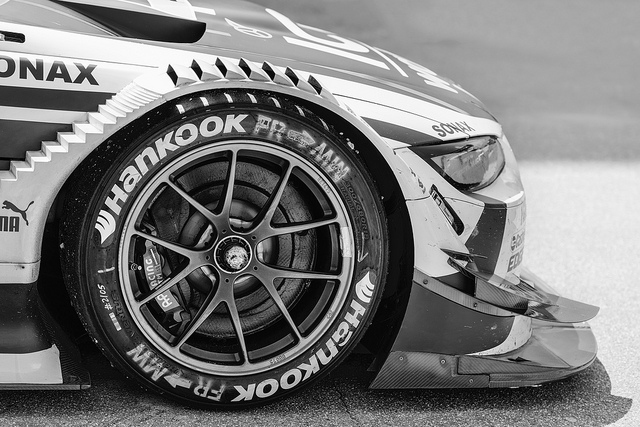 As the official tire sponsor of the sport, Hankook Tire has quickly established itself as the authority in one of the fastest growing motorsports series in North America. Not only is the sport gaining traction, but the idea of drifting has had a tremendous influence on pop culture over the last decade. The latest box office hit from the “Fast and the Furious” movie franchise – Furious 7 – was the 6th highest grossing film of all-time (worldwide) and the 5th highest grossing film in 2015 within the U.S. and Canada. 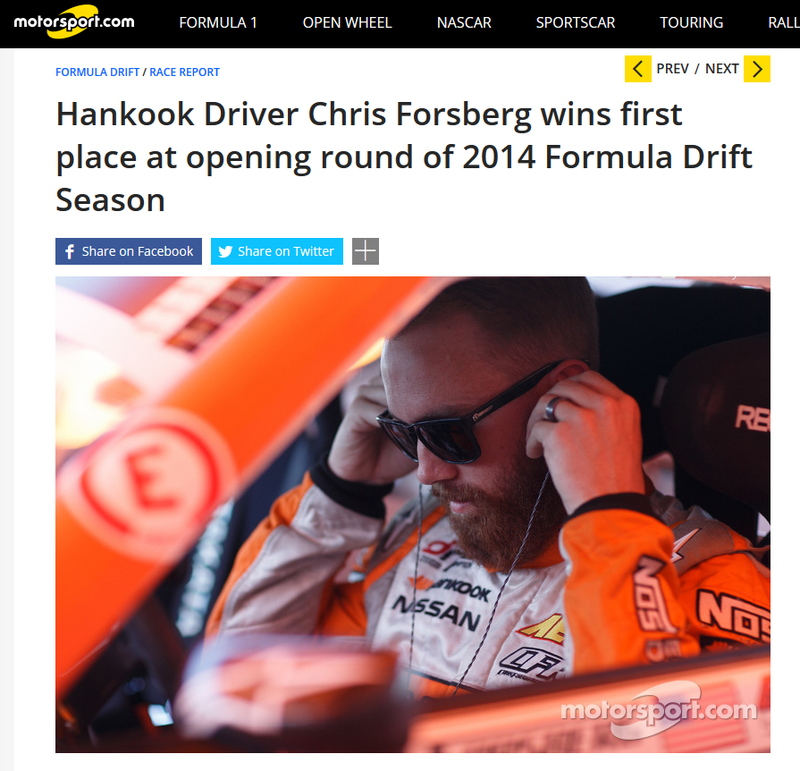 As new fans continued to gravitate toward the high-octane sport in 2015, Hankook Tire brought to life the cutting-edge technology, performance and energy inco rporated into the company’s sponsorship of Formula Drift. 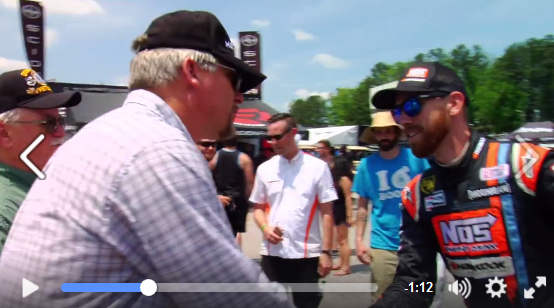 Using Hankook’s involvement in Formula Drift as a pillar of our 2015 communications campaign, we were able to transfer the excitement and energy from the drift track to our audiences through both earned and social media. While the focus of our campaign was once educating our audience on the sport and its drivers, Hankook has now been able to leverage the visibility of their sponsorship to drive engagement with media influencers and consumers. How do you differentiate a tire manufacturing company in a competitive and cluttered industry and excite consumers on the prospect of buying round pieces of rubber? With hundreds of automotive companies constantly pushing out messaging and products, Hankook wanted to cut through the noise to increase their share of voice and build brand awareness through their 2015 motorsports program. the San Francisco Chronicle. In order to drive interest and coverage, we tailored the spokesperson and format of the interview to the preference of the publication. 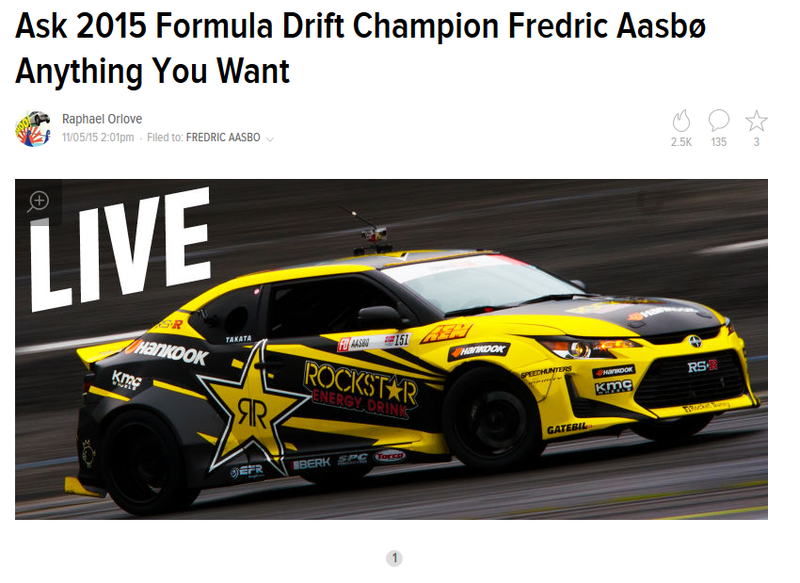 For example, we facilitated a reader Q&A with Jalopnik titled, “Ask 2015 Formula Drift Champion Fredric Aasbo Anything You Want,” in which more than 30 readers participated. Hankook driver Fredric Aasbo had the opportunity to field questions from fans that helped brand his profile, Hankook and the sport. Fredric was able to integrate Hankook messaging into various questions including anecdotes about the Hankook Ventus RS3 tires he uses on his everyday car, calling them “consistent” and “dangerously addictive.” Jalopnik reaches an important audience of motorsports enthusiasts. The website is highly trafficked, garnering over 1.3 million unique monthly visitors, thus influential in building new brand advocates for Hankook. As an active sponsor and participant in global motorsports circuits’ and series’, there was a drumbeat of events and results to promote. Hankook instituted a motorsports newsroom to actively inform our motorsport audience and media targets of race results and success. 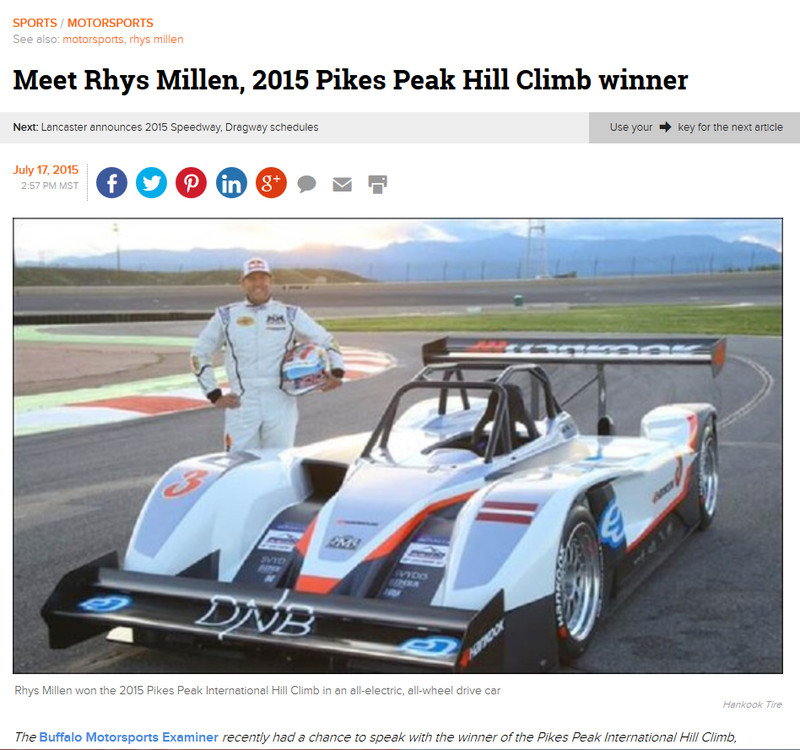 Following race weekends, we increased visibility for the sport and Hankook’s success by issuing news releases, which included multimedia from the event, information on the results and quotes from Hankook personnel. This established Hankook as a resource for motorsports related news around the country, resulting in over 50 unique articles. 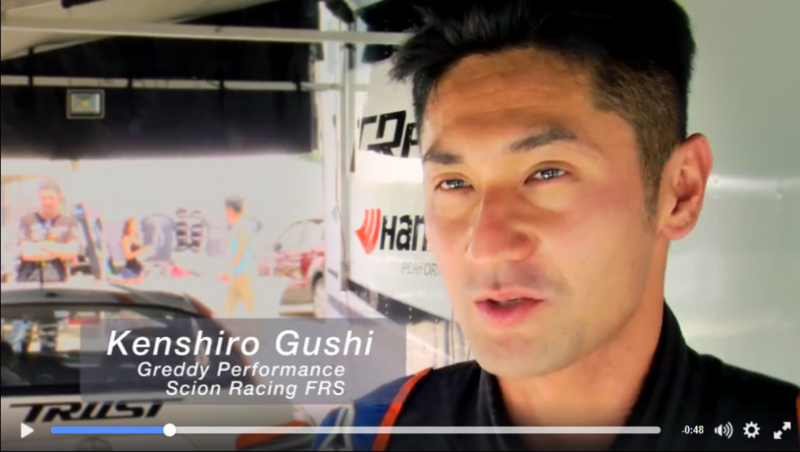 Hankook further amplified its motorsports platform through visibility on broadcast television. Several Formula Drift events were reported and covered by CBS Sports in regional markets. Coverage included clips from the race and interviews with drivers. As a result of the increased visibility of Formula Drift, Hankook driver Conrad Grunewald was featured on Discovery Channel’s primetime television show MythBusters. Conrad, riding in his Formula Drift race vehicle, was asked to demonstrate and instruct the hosts of the show how to drift. The focus of the show was to debunk the myth that a drifting car was moving faster than a turning car. The segment included clips of Formula Drift racing and background on Conrad and his vehicle. Inspired by the success of Hankook Tire’s past Formula Drift social media promotions as well as the growing popularity of Hankook’s various sponsored drivers, we launched a ‘Retweet to Win’ campaign o n Twitter, which was then cross promoted on Facebook. Fans were directed to retweet specific posts that were published weekly on Hankook’s social media pages. 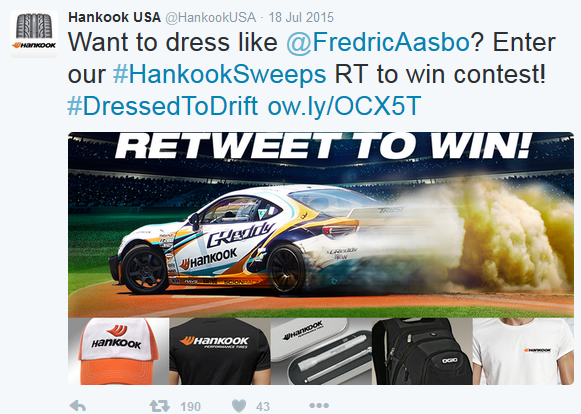 Once retweeted, using the hashtag #HankookSweeps, the fan was entered into a sweepstakes to win a “swag bag” of Hankook Formula Drift gear. Winners were chosen at random on a weekly basis and thousands of fans entered to win. The campaign resulted in extraordinary achievements including an engagement rate of 2.8%, significantly higher than Twitter’s industry benchmark of 1%. The campaign resulted in close to 300,000 impressions and helped boost Hankook’s share of voice on Twitter. Overall increase in share of voice. Hankook moved up 3 places in the rankings of the top 10 tire companies in year over year share of voice. 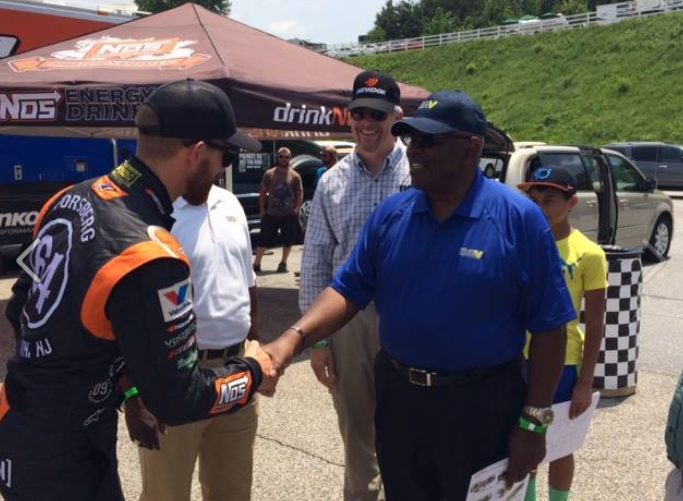 Dozens of stories placed throughout the Formula Drift season featuring Hankook drivers and motorsports connections. Significant increases in multimedia views — the latest Formula Drift multimedia video series reached an audience of over 480,000 fans resulting in over 100,000 engagements. Above average engagement rates with fans — Hankook’s ‘Retweet to Win’ campaign resulted in extraordinary achievements including an engagement rate of 2.8%, significantly higher than Twitter’s industry benchmark of 1%. The campaign resulted in close to 300,000 impressions and helped boost Hankook’s share of voice on Twitter.